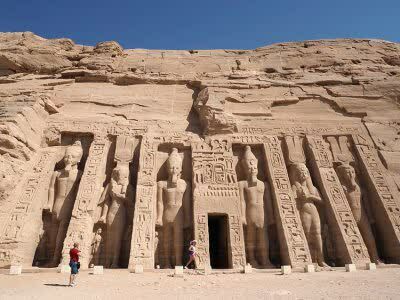 Abu Simbel is about 230 KM away from Aswan, in the southern region of Nubia near the Sudanese border. Here stands the Great Temple of Ramses II, which represents one of the biggest accomplishments of Pharaoh Ramses II. Ramses II pharaoh built this temple to demonstrate his power and divine nature. The temple faces east at a very precise angle. Just twice a year in the early morning, the sun slowly creeps 185 feet into the cavernous temple through its large chambers and narrow halls and illuminates its inner sanctum. This scientific phenomenon occurs on February 22 and October 22, the dates of Ramses II’s birthday and coronation, respectively. For only a few hours, the back wall of the innermost shrine is illuminated, mystically lighting up the three statues of Ramses II, and the sun gods Ra-Horakhte and Amon-Ra. The fourth god represented there, the Theban god of darkness, Ptah, remains in the shadows all year. The mammoth temple is an astounding 100 feet high, 119 feet wide and 185 feet deep, and is carved out of solid limestone. Four enormous seated statues of the Pharaoh dominate its façade, each 67 feet high. The temple was said to radiate power, subjecting all who entered Egypt to its supremacy. The Temple fell out of use when Christianity was instituted in Egypt. It was rediscovered in 1813, when Swiss explorer Burckhard found it abandoned and filled with sand. In the sixties, when the Nile was dammed, and Lake Nasser almost threatened to overwhelm the Temple, UNESCO came to its rescue, and undertook a huge operation to save it, breaking it into pieces and moving it 210m from and 61m higher than their original site. Below the seat of one of the colossal statues of Ramses II is a sunken relief of the god Hapi, the personification of the Nile flood. The figure of Hapi appears twice, tying stems of plants around the hieroglyphic for “unite.” On the left he holds stems of the lotus (symbol of Upper Egypt); on the right he holds stems of the papyrus (symbol of Lower Egypt ). He exhibits both male and female characteristics, suggesting the fertility of the land resulting from the Nile flood. The relief illustrates the Egyptians’ concern for balance and order. Ramses II also built the Small Temple of Hathor and Nefertari at Abu Simbel , both to honor Hathor as the goddess of love and music, as well as his favorite wife, Nefertari, as the deified queen. The façade has six standing statues over 30 feet high of Ramses and Nefertari. These statues are in turn flanked by smaller statues of their children.